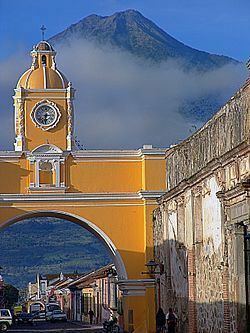 Antigua Guatemala ([anˈtiɣwa ɣwateˈmala]) (commonly referred to as just Antigua or la Antigua) is a city in the central highlands of Guatemala famous for its well-preserved Spanish Baroque-influenced architecture as well as a number of ruins of colonial churches. 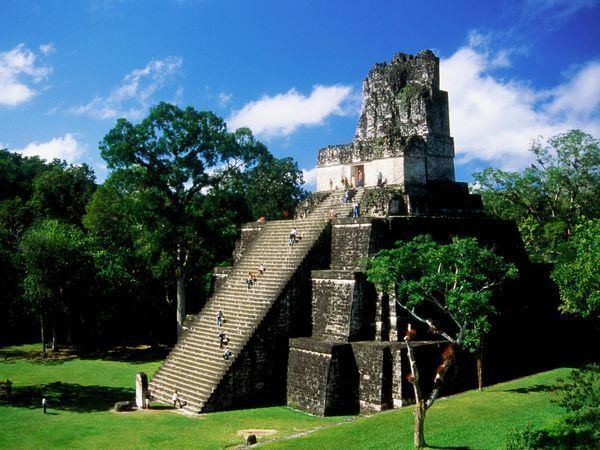 It served as the capital of the Kingdom of Guatemala. It has been designated a UNESCO World Heritage Site. After several Kaqchikel uprisings, the capital was moved to a more suitable site in the Valley of Almolonga (place of water) on November 22, 1527, and kept its original name. This new city was located on the site of present-day San Miguel Escobar, which is a neighborhood in the municipality of Ciudad Vieja. This city was destroyed on September 11, 1541 by a devastating lahar from the Volcán de Agua. As a result, the colonial authorities decided to move the capital once more, this time five miles away to the Panchoy Valley. So, on March 10, 1543 the Spanish conquistadors founded present-day Antigua, and again, it was named Santiago de los Caballeros. For more than 200 years, it served as the seat of the military governor of the Spanish colony of Guatemala, a large region that included almost all of present-day Central America and the southernmost State of Mexico: Chiapas. Santiago de los Caballeros was the third seat of the capital called kingdom of Guatemala, which included the current states of Guatemala, Belize, El Salvador, Honduras, Nicaragua and Costa Rica, besides modern state of Chiapas in Mexico. After a flood destroyed the second city, located in the Valley of Almolonga, on the slopes of Volcán de Agua a new city was built in 1543 in the Valley of Panchoy, and it was established as head of the Real Audiencia of Guatemala in 1549. During its development and splendor, it was known as one of the three most beautiful cities of the Spanish Indies. The city was laid out in a square pattern, with streets running north to south and from east to west, with a central square. Both church and government buildings were designated important places around the central plaza. Between 1549 and 1563, property southeast of the square was sold to the crown and occupied by the first president of the Real Audiencia de los Confines: the lawyer Alonso Lopez Cerrato, who also served as governor and captain general. The original building was small and paneled with portal, tile roof and adobe walls. The city is surrounded by three enormous volcanoes and mountains, plains and hills. This territory was called "Valley of Guatemala" and had 73 villages, two towns and the city of Santiago de los Caballeros. Due to constant problems between the conquerors and the representatives of the crown sent by the king of Spain, the Audiencia de los Confines was abolished in 1565. In 1570 the hearing was restored, this time independent of the viceroy of Mexico and the new organization was called Audiencia of Guatemala. The Franciscan monks were the first to move into the valley Panchoy, the new capital of the Kingdom of Guatemala, and built a chapel on the site where later the Church Escuela de Cristo would be erected. This primitive chapel was destroyed in 1575 by an earthquake and during the next ten years collections were made to build the new complex, two blocks from the previous one. The Franciscan complex became a major cultural and religious center for the entire Captaincy General of Guatemala: Theologians, jurists, philosophers, physicists and mathematicians studied in the school of San Buenaventura, which was located where the monastery ruins are. Notable students included Cristóbal de Villalpando, Thomas Merlo and Alonso de Paz. The first building of a cathedral was begun in 1545 with the debris brought from the destroyed settlement in the valley of Almolonga; however, its construction was hampered by frequent earthquakes along the years. The city was the final resting place of the great Spanish chronicler Bernal Díaz del Castillo, and his remains were interred in one of the churches that was eventually ruined by earthquakes. The construction of the royal houses for the residence of the Captain General and the members of the Real Audiencia started in 1558; the complex also included the Royal Treasury, jail, Army quarters, the Hall of Arms and the housing of Audiencia members. In 1566 King Felipe II of Spain gave it the title of "Muy Noble y Muy Leal" ("Very Noble and Very Loyal"). The Jesuits founded the school of "San Lucas of the Society of Jesus" in 1608, which became famous and was unrivaled in terms of literature and grammar lessons; it was attended by the elite cassles of the city society, such as Francisco Antonio Fuentes y Guzman, the chronicler Francisco Vázquez and Pedro Betancourt. On 18 July 1626 the Jesuit temple was inaugurated; as the rest of the city, it suffered and was damaged by continuous earthquakes that struck the city between the sixteenth and eighteenth centuries. San Juan de Dios: in 1667 the hospital of San Alejo was delivered to the Brothers of San Juan de Dios by the Dominicans who had managed it until then; in 1685, San Alejo and Santiago hospitals joined together, forming the Hospital San Juan de Dios. The temple of the Escuela de Cristo -School of Christ- was founded in the parish of Our Lady of Remedios in 1664 and from 1689 onward it was known as the Congregation of San Felipe de Neri. Meanwhile, around 1690 the Jesuits founded another school: the "San Francisco de Borja" where eventually would study and serve as principal the poet and priest Rafael Landivar, S.J.. In the seventeenth century there were two types of nuns: discalced and urban. Pedro de San José Betancourt came to Guatemalan land in 1650 from his native Tenerife. Upon arrival he suffered a serious illness, during which he had the first opportunity to be with the poor and dispossessed. After his recovery he wanted to make ecclesiastical studies but unable to do so, professed as a Franciscan tertiary in the Convent of San Francisco in Santiago de los Caballeros . He founded shelters for the poor, indigenous and homeless and founded the Order of the Brothers of Our Lady of Bethlehem in 1656, to serve the poor. The Santo Hermano Pedro wrote several books, including: Instruction De la Cruz's brother, Crown of the Passion of Jesus Christ our good or Rules Confraternity Betlemitas. It is considered the great evangelist of the West Indies, just as San Francisco Javier what is the East Indies . The Holy attended poor, sick, orphaned, and dying, and was a precursor of Human Rights . On the other hand, was the first literacy of America and the Order of Betlemitas turn was the first religious order born in the Americas. The Santo Hermano Pedro was a man ahead of his time, both in their methods to teach reading and writing to illiterate and in patient treatment. Francisco Marroquín, first bishop of Guatemala, sent the Spanish King a letter in 1548, asking for a superior education institution for Guatemala, but the letter went unanswered. Towards the end of his life, in 1562, Marroquín left some money in his will to establish a school -which eventually was the "Santo Tomás de Aquino school"- where grammar, arts, philosophy and theology would be taught. Poor Spanish children would be the beneficiaries of this pious work, as they could not travel to those cities where there were universities already, like México City in the New Spain. Historian John Tate Lanning said on this that: "Marroquín testament is so famous, that many people that has not even laid eyes on it say that there are things in the document that are really not in it. Marroquín never talks about a University, much less establishing one..." On the other hand, there is indeed a document from Mayor Pedro Crespo Suarez, who left twenty thousand pesos after his death to set up classes in the University that "was being asked to crown". The Jesuits opposed a university establishment, given that they did not like the idea of having the other regular clergy orders -Mercedarians, Franciscans and Order of Preachers- taking the initiative in religious and educational issues. In August 1655, the Society of Jesus had bought the whole lot from the Díaz del Castillo family and by then, their San Lucas School was well known in the region and it even granted two university degrees. In 1653, the San Lucas School had a staff of only thirteen priests, a very small number compared to the size of the building; the Jesuits, however, made a major impact on the cultural and educational life in the Capitanía General of Guatemala. The school was the city's most prestigious and from it graduated most of the elite members of society of the time. Most of its students were secular and went on to get the best positions in the country. After several decades, petitions and lawsuits, king Carlos II expedited a royal decree, on January 31, 1676, allowing Capitanía General of Guatemala to set its university or "General Study". After a lengthy and cumbersome organization process that lasted five years, the university started classes on January 7, 1681, with more than sixty registered students under President Doctor José de Baños y Soto Mayor, Cathedral archdeacon, King of Spain preacher and Doctor from University of Osuna. The university began its activities under the protection of Saint Carlos Borromeo, and its norms and regulations were copied from those of the México university which, in turn, were adapted from those of the Universidad de Salamanca in Spain. The Royal University of San Carlos Borromeo became pontifical the Papal Bull of Pope Innocent XI issued dated 18 June 1687. The strongest earthquakes experienced by the city of Santiago de los Caballeros before its final move in 1776 were the San Miguel earthquakes in 1717. At that time, the power of the Catholic Church over the Spanish Empire citizens was absolute and, therefore, any natural disaster was considered as divine punishment. In the city, people also believed that the proximity of the Volcán de Fuego (English:Volcano of Fire) was the cause of earthquakes; great architect Diego de Porres even said that all the earthquakes were caused volcano explosions. On August 27 there was a strong eruption of Volcán de Fuego, which lasted until August 30; the residents of the city asked for help to Santo Cristo of the Cathedral and to the Virgen del Socorro who were sworn patrons of the Volcan de Fuego. On August 29 a Virgen del Rosario procession took to the streets after a century without leaving her temple, and there were many more holy processions until 29 September, the day of San Miguel. Early afternoon earthquakes were minor, but at about 7:00 pm there was a strong earthquake that forced residents to leave their homes; tremors and rumblings followed until four o'clock. The neighbors took to the streets and loudly confessed their sins, bracing for the worst. On March 4, 1751, the San Casimiro earthquake destroyed the city of Santiago de Guatemala once more. The church roof of the Society of Jesus complex fell to the ground, forcing the Jesuits to once again ask for help to the parishioners to rebuild; once again, the building was among the most beautiful of the city when the repairs were completed. In fact, a prosperity period began after the San Casimiro earthquake, as the city saw major improvements, such as street embellishment and tap water system introduction. A new City Hall was built in and on July 17, 1753 work on the Jesuit plaza in front of the church is finished. On 12 June 1773 Captain General Martín de Mayorga was inaugurated, and alongside Cortés y Larráz and the regular clergy vicars, were the top authorities in the Kingdom of Guatemala and would be the main characters in the events that followed the 1773 earthquakes. The Santa Marta earthquake practically demolished the church and sections of the convent of the Society of Jesus. Its cloisters and towers were in ruins, the walls were at dangerous angles and the "Casa de Ejercicios" was turned into rubble. By a Royal decree of July 21, 1775, the city move to the "Virgin valley" was authorized. This was a final order that had to be obeyed by all the people, who started to move slowly, starting on December of that year. In order to build the new city it was necessary to get construction material from the old abandoned churches in Santiago de Guatemala. However, in the case of the Society of Jesus church, there was strong opposition from the neighbors to any possible dismantling of the structure since they considered that it could still be repaired. After the independence of Guatemala from Spain in 1821, the Jesuit complex became public property once again and was in several lawsuits that lasted until 1829, when the regular clergy and the conservative Aycinena clan were expelled from Central America after the invasion of liberal general Francisco Morazán and the establishment of a secular government. The new liberal government decreed that all the confiscated Catholic church possessions had to be turned into elementary schools and university classrooms. As of 1850, Antigua had an estimated population of 9,000. and by 1865, the building was functioning as a vapor activated thread mill, but it was not profitable due to a lack of expert technicians and raw material; and by 1872, the Jesuits were once again expelled from Guatemala by the liberal regime of Justo Rufino Barrios. In 1884 City Hall made an announcement that it intended to transform the old Society of Jesus buildings into a market, in spite of the strong opposition from the neighbors that already had small shops on the plaza. It was until 1912 that a market was placed in the complex. In April 1920, during the very last days of Manuel Estrada Cabrera regime, prince Wilhelm of Sweden visited Antigua Guatemala and wrote about his impressions on the city in his book Between two continents. His book is an objective description of the terrible conditions the road and the ruins used to be in: for some little way outside Guatemala City it was a fairly decent car ride, but then the roads began developing sandhills, and later, ravines of tumbled stone as two years earlier, the country had been devastated by the a powerful earthquake and the government corruption made the recovery impossible. The hills grew steeper and steeper, the jolting more pronounced and the stones even sharper; besides, on top of the road was a two-foot layer of dust which hid the pitfalls but did not detract from their effect. Along the way, they passed long lines of Indians on their way to Guatemala City, carrying their heavy burdens with apparent ease; men, women and children carried something in the way of a load, and they all carried it quickly. With respect to traffic, it was almost non-existent, aside from mule pulled wagons. After passing Mixco, the road was going more steeply upward, with a precipitous drop on one side and sheer cliff rising on the other; here and there a cross stood by the wayside, marking the spot where some traveler had died. After reaching the highest point, they started down towards Antigua. The city was in sight when a person in uniform planted himself in front of the car and it turned out to be the city commandant, along with six soldiers with wooden guns. 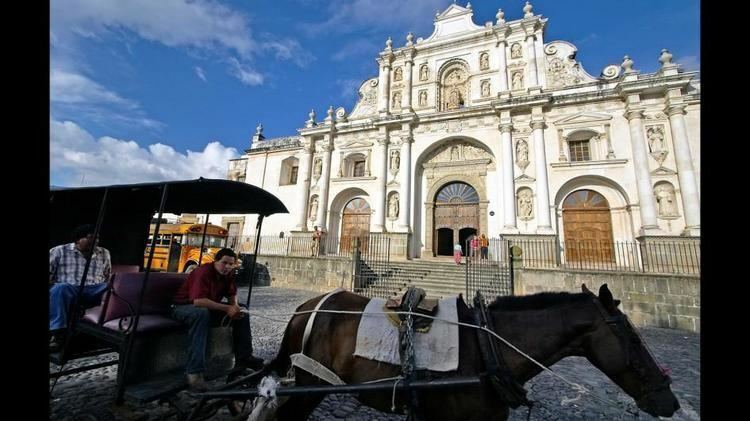 Compared to Guatemala City at the time, Antigua was quite nicely kept, although all the churches were equally dilapidated and left entirely to themselves, as rebuilding since 1773 was confined to the strictly necessary. For the most part, only blank walls and shattered domes remained to greet the visitor by 1920. and some of the churches were in pitiful conditions; in Santa Clara, for example, a mule was grazing, and in the Church of Grace a native family had taken up its quarters, along with their varied collection of domestic animals. The Escuela de Cristo was one of the best preserved churches and the most picturesque at the time, given that it was united with a convent that was still standing. The Father that received the Prince and his three companions told them that all the silver and gold from the church had already been sold by his predecessors, so that he, to his extreme regret, was unable to sell any to them. The old Capuchin monastery with its many underground passages from the monks' cells to those of the nuns was worth a visit, especially one part where the cells were built in a circle surrounding a central common chamber. Central Park -Parque Central- is the heart of the city. The reconstructed fountain there is a popular gathering spot. Off to the side of the Central Park, the Arco de Santa Catalina is among the many notable architectural landmarks of La Antigua. La Antigua is noted for its very elaborate religious celebrations during Lent (Cuaresma), leading up to Holy Week (Semana Santa) and Easter (Pascua). Each Sunday in Lent, one of the local parishes sponsor a Procession through the streets of Antigua. Elaborate and beautiful artistic carpets predominantly made of dyed sawdust, flowers, pine needles and even fruits and vegetables adorn the processions' path. Due to its popularity amongst tourists and its very well developed tourism infrastructure, Antigua Guatemala is often used as a central location in which many choose to set up base and from here, visit other tourist areas in Guatemala and Central America. Cruise ships that dock at Guatemalan ports offer trips to Antigua from both the Pacific and Atlantic. Antigua also holds a sizeable retirement community from the US as well as Europe. Antigua is known as a destination for people who want to learn Spanish through immersion. There are many Spanish language schools in Antigua, and it is one of the most popular and best recognized centers for Spanish language study by students from Europe, Asia and North America. Language institutes are one of the primary industries of Antigua, along with tourism. Antigua GFC football club has played in the Guatemala top division for several years but have been playing in the second division lately. Their home stadium is the Estadio Pensativo which has a capacity of 9,000. They are nicknamed Los panzas verdes ("Green bellies"). There are many restaurants in Antigua. Many small eateries can be found at the Antigua marketplace, next to the central bus stop, as well as adjoining the main market and within it. Mediterranean, Italian, Asian, American, and traditional Guatemalan cuisines are represented. Three large volcanoes dominate the horizon around Antigua. The most commanding, to the south of the city, is the Volcán de Agua or "Volcano of Water", some 3,766 metres (12,356 ft) high. When the Spanish arrived, the inhabitants of the zone, Kakchikel Mayas, called it Hunapú (and they still do). However, it became known as Volcán de Agua after a lahar from the volcano buried the second site of the capital, which prompted the Spanish authorities to move the capital to present-day Antigua. The original site of the 2nd capital is now the village San Miguel Escobar. To the west of the city are a pair of peaks, Acatenango, which last erupted in 1972, some 3,976 metres (13,045 ft) high, and the Volcán de Fuego or "Volcano of Fire", some 3,763 metres (12,346 ft) high. "Fuego" is famous for being almost constantly active at a low level. Steam and gas issue from its top daily, a larger eruption occurred in September 2012. Before it was declared a National Monument by president Jorge Ubico on March 30, 1944 the city ruins were practically abandoned. The following galleries show images of the destruction of the structures due to earthquakes and abandonment. There were other churches, like Nuestra Señora del Carmen and the Society of Jesus, that endured the 1773 earthquake relatively well, but they were abandoned and the earthquakes from 1917–18 and 1976 destroyed them. In the particular case of de San Francisco El Grande church, this was in good structural shape after the 1773 and 1917 earthquakes and it was rebuilt in 1967 when the Franciscans returned to Guatemala, which eventually protected the stsructure from the 1976 earthquake. Finally, La Merced church was practically new in 1773, and it has withstand time and earthquakes since; the church was not abandoned in 1776, but it was indeed abandoned in 1829 when the Mercedarians were expelled from Central America by general Francisco Morazán, along with the rest of regular clergy and the conservative party members and Aycinena family. The initial earthquake sequences from the Jack Nicholson's film The Border were filmed in Antigua Guatemala, specifically in La Recoleccion Architectural Complex.